Captain Henry O'Reilly, an Irish master mariner, left his job sailing steam ships out of Liverpool in England to emigrate to Australia and arrived in Sydney in 1854 with thirty quid in his pocket and a belief that divine providence would present opportunities. He was correct - he was immediately hired by the Australasian Steam Navigation Company to sail steamers between Sydney and Brisbane. O'Reilly made hundreds of trips between Sydney and Brisbane, mainly on the steamer Telegraph, and in 1863 he was made manager of the ASN operation in Brisbane, triggering a move up here. The forerunner to this building would have been his Brisbane office. 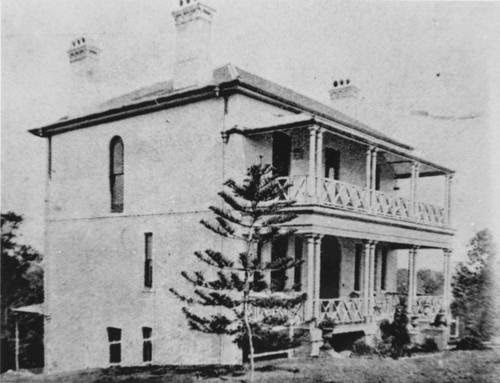 Captain O'Reilly and his family for a time lived in the house Montpelier that overlooked the river in a spot known then as O'Reilly's Hill, later to become Bowen Hills and the site of Cloudland. FOR SALE, " TOONARBIN," a Superior Suburban Property, on the River, South Brisbane, near Hill End, containing about 8 acres, thoroughly fenced, substantial Stables and Offices, well-stocked Garden, Water Dams, &c., &c. Apply to Mr. BACKHOUSE, Architect. O'Reilly engaged Backhouse to design a house for him on the property and the following photograph shows the original form of the residence. The name Toonarbin that Backhouse had bestowed on the land came originally from a Henry Kingsley novel, and it was applied to the house. Here is a photograph showing the early form of the house - note the ornate chimneys on each corner. O'Reilly lived at Toonarbin until his death in 1877, and his wife and children continued to live there for a considerable time after that. His son Charles O"Reilly was a customs agent and his bonded stores at Margaret St in Brisbane's CBD were recently demolished despite a call for them to be added to heritage lists. In 1926 Archbishop Duhig bought the property. Some of the land was sub-divided and sold off and the residence was converted to a convent for the Sisters of Mercy. Some improvements and alterations, including replacing the wooden balconies and facade with brick, took place then to cater for its new function. 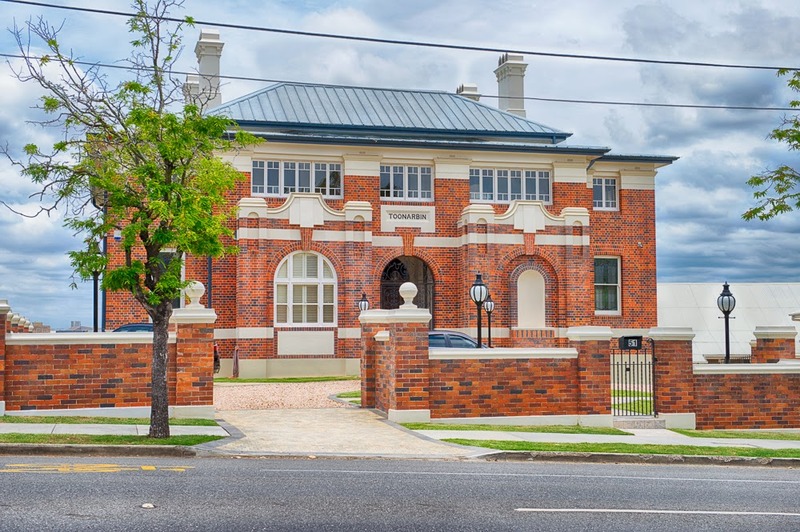 The building operated as a convent through to around 1995 and was then vacant for a dozen years until purchased by the current owners who set about restoring the building to its former glory. A labour of love over the ensuing years has Toonarbin looking like this. Although the structure has been enlarged and enclosed in brick, the chimneys provide external evidence of the building's origins. Proof of the success of the restoration is illustrated by the fact that Toonarbin won a High Commendation at the announcement of the National Trust's heritage awards for 2014. This is our final post for 2014. Seasons Greetings to all readers! We will be back in 2015. I was fortunate to be able to tour this beautiful house during the October Open House Brisbane - it has been so well restored. As far as I know, this building was extended to create Naldham House. Thanks for the link to the early photo of the ASN office, which is the original form of Naldham House. Yes, I missed it too. The external appearance of the building is wonderful - it would be marvellous to see inside. Over the years I have heard various stories that the O'Reilly family of Toonarbin were directly related to the O'Reilly family of Lamington Plateau fame. Does anyone know if this is true? The southern half of Toonarbin's original estate, fronting the river, was subdivided in the 1930s and sold as 'Riverview' estate. Brisbane City Council has an original 'Riverview' real estate sales poster in their archives. I have no information of any connection between Captain O'Reilly and the Binna Burra family of the same name. When the building was renovated and preserved, did they not want to rebuild the gorgeous balconies? I suspect the original balconies were done away with as part of the conversion to use as a convent way back in the 1920s. Don't know why they couldn't have been restored later. they are now front rooms. the original house was quite narrow.